The numerous Indian tribes living in Iowa at the time of early European exploration included Dakota, Ioway, Otoe, Illini, Sauk and Omaha. The French claimed the lands of Iowa which borders the Mississippi, Missouri and the Big Sioux Rivers. By 1763, France transferred that claim to Spain. The Spanish allowed French and British traders come through the area, who built trading posts in several locations. By 1800 France had regained control of the region from Spain, but with the Louisiana Purchase of 1803, which Iowa was part of, the United States took military control with the building of Fort Madison. The U.S. government then had encouraged settlement of lands east of the Mississippi and removal of all Indians to the western side. In Iowa, trade continued in furs and lead, but the Indian population was declining due to disease and forced emigration. During the 1840s, major groups of Americans from Pennsylvania, New York, Ohio, Kentucky, Virginia and Indiana resettled in Iowa. 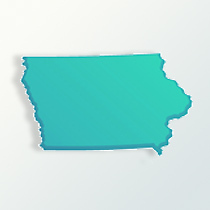 In 1838, Iowa had been made a territory, then by December 28, 1846, Iowa was admitted as the 29th state. The state encouraged further emigration with special campaigns to attract settlers and investors is important in Iowa genealogy. It boasted of the rich farmlands, plus free and open society. In the 1860s, there were no Civil War battles in the state, but Iowa did send massive supplies of food to the armies and the eastern cities along with 75,000 soldiers. After the war, there was a dramatically population growth, from 674,913 people in 1860 to 1,194,020 in 1870. With the railroad system, people could travel there easier and farm products could be sent across the country. For decades as well as into the 20th century, Iowa’s economy was very strong in agriculture. Near the end of the 20th century, there developed mixture of manufacturing, biotechnology, financial and insurance services along with government services. With Iowa’s 3 million citizens today, about 96 percent are whites and 2.5 percent are African-Americans. A strong Asian population is reflected in the 1.4 percent population. Over the decades those who came to Iowa have been from various Western European nations. Those with a German and Irish heritage represent the highest numbers. For Iowa genealogy those numbers also embody those from the eastern states who emigrated in the 19th century.